GRJC Jeep Show "Jeeps in the Vineyard"
The unique RockAuto.com catalog makes it easy to see all the parts we have for your vehicle. Search boxes are available as well to help scroll to your specific vehicle, identify which category a part is listed under or do a Part Number Search. Type "core" into a search box and see a list of the most relevant Help Topics regarding cores, including what a part core is and how to set up a return. Only typing "whol" in a search box is enough to find out what RockAuto Wholesaler Closeouts are. Typing "past" will bring up instructions on how to see your past orders and explain the option of creating a RockAuto account. 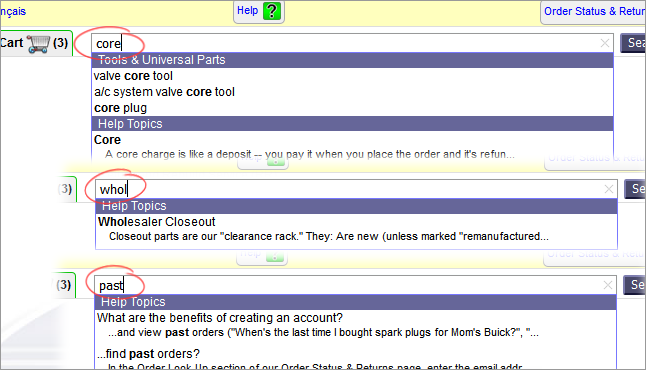 It is safe for you to assume answers to nearly all your questions about choosing parts, ordering, returns, problems, etc. are available via the search box (or the RockAuto Help Page). We have been serving customers online since the turn of the century. That is a lot of time for questions to earn "frequently asked" status! Even questions you might think are too broad have been frequently asked before such as, "Why are your prices lower than at local stores?" and "Which part has the best quality?" Go ahead, type it in the search box!